What do you get when you mix comedy and a mockery of popular movies? You get the Mocky Horror Picture Show! 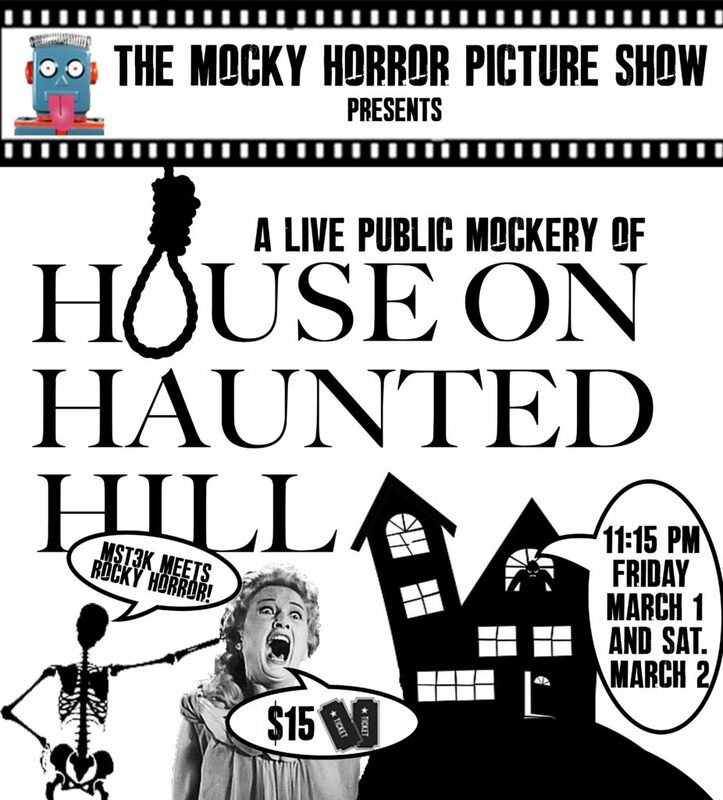 Mocky Horror is a live, interactive, movie mocking comedy show. Established in 2018, the group stars comedians/writers Liz Barksdale, Danny Gallagher and Bryan Hickey who fling jokes at movies while you’re watching them. The audience also gets to join the action with special prompts that appear on the screen telling them to shout jokes and lines and throw props at the screen at just the right moments. Ready to interact with the writers/comedians?? We sure are! Coming up March 1 – 2, the trio will perform one of Vincent Price’s and director William Castle’s biggest cult classics, “House on Haunted Hill.” Synopsis: Five strangers enter a haunted house in order to win a $10,000 prize from an eccentric millionaire and his scheming wife…. but are there really ghosts in the house, or is someone or some thing pulling the strings? Doors open at 10:45 p.m. for seating, food and beverage, and the show begins at 11:15 p.m. Tickets are $15. Purchase tickets on the Pocket Sandwich Theatre website. Located off Mockingbird Lane in Dallas, the Pocket Sandwich Theatre has been showcasing plays of all genres for decades. Known for their popcorn-throwing, interactive shows, the theatre features comedies, comedy troupes, stand-up comedy, musicals and more. Check out more spoofs coming up at the theatre!